Jennifer Korsen is a Los Angeles based artist that works in many mediums. A third generation Angeleno. She is the Great Niece of LA Times illustrator Raymond Serata and she shares his creative drive. Korsen draws her inspirations from the pulse of the city, and all the endless possibilities that exist in a place like LA. She also has a deep fascination with anatomical imagery that stems from watching her mother battle cancer when she was very young. Korsen is self taught and works mostly in acrylic, spray paint, wood, and cut paper, but enjoys experimenting and is constantly exploring new mediums. In 2011 she began the “Paper Hearts” series of mixed media shadowboxes that launched her career in the art world. This body of work gained instant attention and was collected extensively, leading to her first solo exhibition in 2013 at Coba Gallery, and a residency at the Hive Gallery in Downtown LA. Subsequent residencies include Imperial Art Studios and she was the recipient of the first ever Artist Residency at the Neutra Museum in Silver Lake. Her signature series of abstracted anatomical hearts have been exhibited all over Los Angeles in galleries such as Copro Nason, Gabba Gallery, Lab Art, The Hive, La Luz de Jesus, Cactus and many others. Outside of Los Angeles, she has exhibited in New York, Las Vegas, Portland, Seattle, Miami and internationally in the United Kingdom, and Germany. Her work has sold at Julien’s and Paddle 8 auctions and she has been featured in lectures at Christie’s in Beverly Hills, and on Sotheby’s street art tours. Her client work includes Red Bull, Whole Foods, Toms, Perrier, Etsy, and Brandable. She has been featured in several print and online publications both domestic and international. 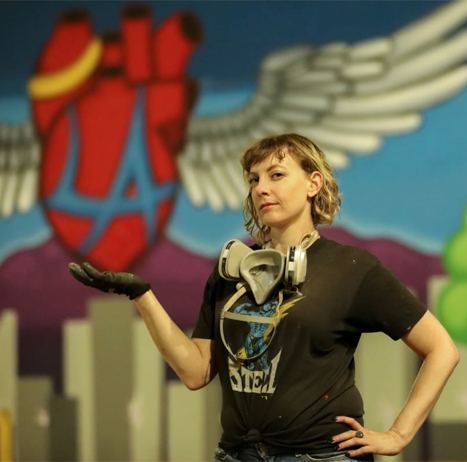 Korsen’s large scale heart murals and wooden installations in abandoned payphones have become a staple in the world of LA Street Art. Korsen currently lives and works in the Silver Lake neighborhood of Los Angeles. For more information on Jennifer Korsen visit humansmakeart.com and follow on social media @humansmakeart.